Manufactured in ex-Tchecoslovaquie from Circa 1932 until Circa 1932. Vacláv Kolár, from Modrany near Prague (Czechoslovakia), produced cameras for a short period, between circa 1930 and 1935 when, according to McKeown, went bankrupt. His cameras are rare nowadays. The Kolex is a small self-erecting plate folding camera, for plates of 6 x 4.5 cm. It has a folding Newton finder. The shutter is an instantaneous Gauthier Pronto delivering speeds in the range 1/25 to 1/100 plus B and T. It has a delay lever which lasts for about 10 seconds. 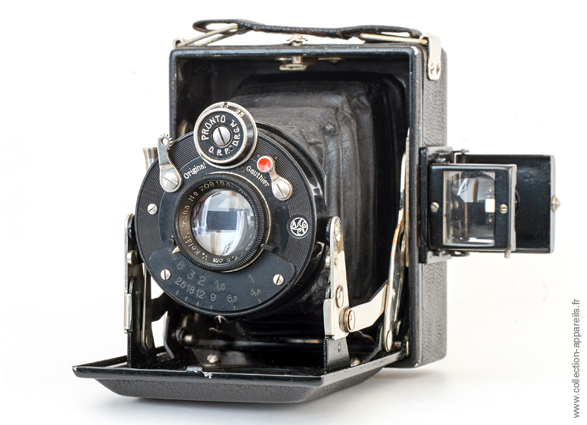 The lens is a Vaclav Kolar Anastigmat Rekolar with 7.5 cm of focal length and 4,5 of maximum aperture. Focusing down to 1 m is achieved on the lens barrel.